Top Spring® Life Energy Water System is the most state-of-the-art technical product in the world. It produces Quantum Harmonic Oscillator (QHO) through a unique SEH® Super Energy Control combined with other technologies, which can make life energy water to generate exclusive substantial anti-oxidation capability. Try to make tea or coffee with Top Spring® Life Energy Water. After 30 minutes, 1 hour to several hours or even overnight, you can discover that the taste is still sweet and not bitter, just like fresh made. With mineral water, deep sea water, RO water, ionized water, magnetic water or water out of regular filters or general energy water filters, the taste stars to become bitter after just 5-10 minutes because of oxidation. Moreover, this QHO can penetrate glasses and make soy sauce, wine or vinegar placed in a bath of Life Energy Water minimizes the capacity of impure substances to the lowest. In 15-20 minutes, the liquors will attain the same qualities as those made over many long years and the quality won’t return to the original condition. Our product’s functions are million times stronger than the filters with far-infrared or other so-called “energy stones”. And our product is the only one, which possesses this unique function in the world. The feature generated from the following three experiments cannot be achieved by any brand of mineral water, deep sea water, RO water, ionized water, magnetic water or water out of regular filters or general energy water filters. Only Top Spring® Life Energy Water System can achieve these. ------------------------------------------------------------ 1. Try to make any kind of tea, such as black tea, green tea, or coffee with Top Spring® Life Energy Water and drinks remain like freshly made just 5 minutes just 5 minutes earlier after 10 minutes, 30 minutes, an hour, 3 hours, 5 hours or even overnight. The taste is still sweet and not bitter. With mineral water, deep sea water, RO water, ionized water, magnetic water or water out of regular filters or general energy water filters, the taste stars to become bitter after just 5-10 minutes because of oxidation. ------------------------------------------------------------ 2. Pour a glass of bargain whisky, bandy, wine, Japanese sake, vodka, soy sauce or vinegar and placed in a bath of Life Energy Water for 30 minutes. The taste becomes very smooth, just like the quality of high-priced drinks. ------------------------------------------------------------ 3. Buy some sea shrimps and also soaking by tap water and Top Spring® Life Energy Water after 20 minutes and also store them in freezer about one month. The head of shrimps have turned to black color which was soaked by tap water and also have some fishy smell after one week, however, the head of shrimps is still remain the same color which was soaked by Top Spring® Life Energy Water and also without fishy smell, retreat the ice and also cook them, the taste of the shrimps is sweeter and bitter than those just buy from the market. ------------------------------------------------------------ § The Eight Features of Top Spring® Life Energy Water : 1. 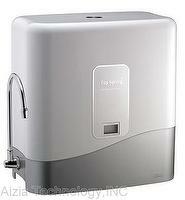 Gives the water high anti-oxidation capability and higher reduction power, preserve the freshness of foods. 2. Makes the cluster of water molecules smaller and easier for human body to absorb. 3. Makes oxygen content high in the water to facilitate healthier bodies. 4. Has appropriate surfactant capability to remove the harmful substances from the food. 5. Removes chlorine, impurity and odor in the water 6. Remove the pesticides in the fresh vegetables and fruit in addition to serving solely for drinking purpose. 7. Keeps the beneficial minerals in the water. 8. Removes the harmful substances in the water, for example, heavy mental, agricultural chemicals and common carcinogens in tap water like haloform, nitrate nitrogen, nitrite nitrogen and so on. Aizia Technology, Inc. is committed to various kinds of biotechnology which are healthy to human and develop the Top Spring® Life Energy Water System which is distinct from other drinking water systems on the market with our associated company “SEH Biotechnology Co., LTD”. This is because that the integration of the world’s unique SEH® Super Energy Control System and various technologies makes the Top Spring® Life Energy Water System leading the market and a food quality system to make food value higher and fresher permanently. The cutting-edge technologies of SEH Biotech provide this system an extremely powerful antioxidant function and energy. Thus, this system can produce the water which is closer to the human bodies and completely meets the water in the human body which is not easy to be oxidized. Except for providing customers better water than the mineral water, this system makes the food fresher and with high quality. Furthermore, the system has dozens of different home user conveniences and business class applications. We are looking for general agents worldwide and provide these world-leading and excellent products to benefit people in the whole world. Is it you? If you have the same faith like ours to make people live a healthy life and also would like to access to a good profit, please contact us immediately and let us create business opportunities together.